This Thursday the editions of the Volta a la Comunitat Valenciana 2019 in masculine and feminine category were presented. Alejandro Valverde and Gearint Thomas will participate. 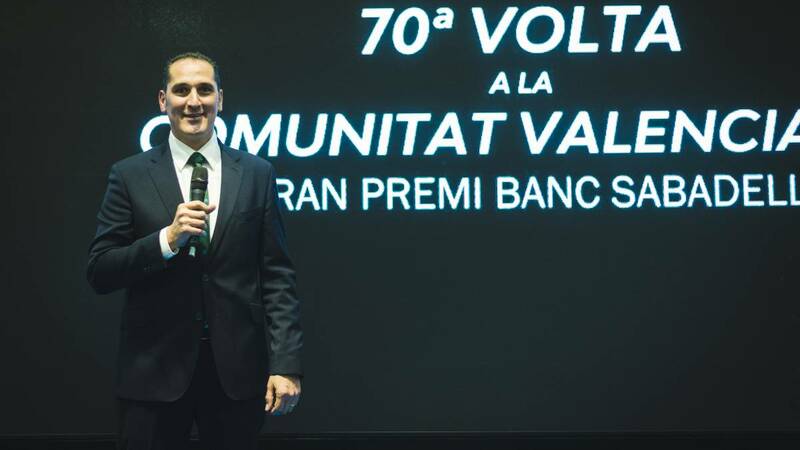 This Thursday the 70th Volta to the Comunitat Gran Premi Banc Sabadell has been presented, which will begin again in Orihuela, on February 6, and will end on Sunday, February 10, in the Plaza del Ayuntamiento de Valencia as a tradition mark. Undoubtedly, this sporting event, the oldest in the Valencian Community, has been consolidated as a must for the best teams in the world, since in 2015 Angel Casero reactivated after eight years of absence. In this sense, the General Director of Vuelta CV has expressed that "it is very important that the World Champion, the winner of the Tour de France, wants to come". "Without a doubt, all this means something," said Angel Casero. The General Director of the VCV stressed his satisfaction with the evolution of the event and thanked, once again, all the institutions, town halls, sponsors, civil guard, volunteers , his bet for this event. 2ªetapa. Alicante- Alicante with 166 km. Stage in line, with the first complicated kilometers. "It is ideal for brave people who seek prominence in the getaway, the second part easier with almost 40 kilometers of descent to the finish line where the sprinters must command", explained Paco Benítez. The 3rd stage will run through the province of Valencia with departure in Quart de Poblet and arrival in Chera with a route of 191km. "A beautiful mid-mountain stage, which in the slang we call ambush, with a demanding course where we will see which runners want to win the VCV19," said its Technical Director. As for the 4th stage, the queen stage, the VCV will move to the province of Castellón with departure in Vila-Real and arrival in Alcossebre in the Hermitage of Santa Llúcia with 188 km. A tough stage consisting of four mountain passes and final in Santa Lluçia with very hard ramps of 20% . "Here certainly we will know the winner of the VCV 19", explained the Technical Director. La última y 5ªetapa. Paterna-Valencia composed of 88 km. It is a flat stage with an urban circuit through the streets of Valencia with final Sprint in the Plaza del Ayuntamiento de Valencia "Without a doubt it will be a recognition to the winner of the 70th edition of the VCV19" . As for runners, the presence of the current world champion Alejandro Valverde (Movistar Team), who won the Vuelta CV 2018, as well as Geraint Thomas (Sky); Niki Terpstra (Direct Energie); Esteban Chaves (Midchelton Scott); Matteo Trentin (Midchelton Scott); Adam Yates (Midchelton Scott); Daniel Martin (UAE Emirates) and Rui Costa (UAE Emirates), among others. 24 teams will participate in the VCV: CCC, Katusha, Scott Mitchelton, Emirates UAE, Movistar, Jumbo-Visma, Astana, AG2r the Mondiale, Dimension Data , Sky, Bahrain-Merida, Direct Energie, Gazprom, Israel, Nippo Vini Fantini, S Vlanderen Baloise, Caja Rural, Cofidis, Rally, Oporto, Euskadi, Fundacion Contador, Murias, Burgos BH. This year the organization of the Vuelta a la Comunitat Valenciana opens with the first edition of Vuelta CV Féminas, next February 10, with a route of 88.5 km with departure in Paterna, at 09:00 hours, and arrival in Valencia, the same circuit of the fifth and final stage of the VCV. La Vuelta CV Females has started with a lot of force and is that it stands out as the first race in equality in the prize pool, and will award 2,435 euros to the winning cyclist, the same amount that is awarded in a male event. In this sense, Silvia Tirado, director of the CV Vuelta Féminas, stressed that "we are at the level of the best races in the world. The girls will feel like male cyclists. " In this first edition, 20 teams will participate, with six runners each." Virtually all the Spanish teams are confirmed as the Movistar Team, which will come with a powerful team. good to be the first year, "said Silvia Tirado. For his part, the deputy of Youth, Sports and Equality, Isabel Garcia, congratulated Angel Casero and his team for this initiative222222 "because this shows the equality of men and women and also to have a woman as director" . In addition, it should be noted that the VCV maintains as always its solidarity component through the solidarity jersey with the objective of collecting benefits for the Association Valenciana Cerebral Paralysis (Avapace) whose march will take place on Sunday February 10 through the center of Valencia. In the act, which took place near the sea in the Veles e Vents building in Valencia, were present the Banc Sabadell, main sponsor of the Vuelta CV, leading Valencian authorities such as the General Director of Sports, Josep Miquel Moya, the regional secretary of the Valencian Tourism Agency, José Gisbert, the deputy of Tourism of Valencia, Pilar Moncho, the deputy of Sports of Castellón, Luis Martínez, the mayor of Orihuela, Emilio Bascuñana, the mayor of Paterna, Juan Antonio Sagredo, among other authorities s In addition to former professional cyclists like Quique Gutiérrez; Stefano Garzelli, Miguel Soro, Fernando Escartín, Pepe Grande, as well as sponsors and collaborators of the Vuelta CV. As the closing of the event, the Valencian music group Ñekü performed for the second year in a row they are the authors of the official song of the Volta with "Go back to Verte" .